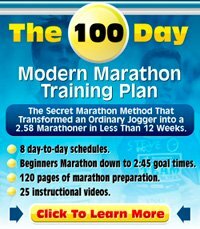 Training For A Marathon ? Welcome ! 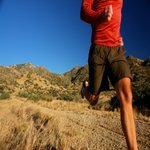 "The Starting Page For Training For A Marathon - Some Specific All Individual Info"
You have reached the starting page with the basic tips for training for a marathon. Like I said on the front page, the information about the marathon is almost overwhelming. Just like the Mount Everest analogue ; had it just been a little lower, many more would be able to climb it successfully. Most get into trouble around the 30km/20 mile mark. Out of the 42.195 total km/26.2 miles. To the key elements of training for a marathon. 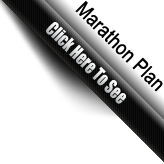 There you have day to day schedules to lead you through to the marathon in the best possible way based on the up-to-date modern methods of Marathon Training that you can read about on this page and in this site. The Keys To Training For A Marathon Successfully Is A Sound Balance. And of course hitting it perfect on the day. This will be the starting place for information about those aspects. Simply training for a marathon. To try and catch some of those aspects you see above. An example, not trying to get too philosophical though..
To take periodization ; one of the main marathon ideas of modern marathoning is splitting training into different periods of training. Where you focus on 5k/10k first up in the cycle, then half marathon, before marathon and a tapering period respectively. Though this is modern marathoning, is is surprising that many go on with a pure marathon approach from day one in their training. Only to run into injuries, over-use or simple under-performing later on. In a more structured plan, you'll have a greater chance of "over-achieving", injury-free, more fun running, as compared to what a non-structured plan would provide. As you move through these pages, you'll see a big focus on variations. Periodization means that you train for a few weeks at a specific type of training/intensity, before switching to another type. This way, you teach your body a whole different story as oppose to just going out on a long-run-go-with-the-flow. For the more experienced marathon runners, you'll see that some of the "philosophy" here in terms of marathon variation/periodization is very similar to the Italian school of marathoning. What is the Italian school of marathoning? It is what has brought some of the greatest marathoners, to the top, in the last three decades, including 2 of 5 last Olympic Gold Winners in the marathon. Structured periodization, very specific work at the right time. You'll see parts of this philosophy in both the 5k training articles (check out the 5k marathon training article there) and in the half marathon training articles. Right away - in your training cycle : try to run either 14 days hard before one week easy. Alternativly 10 days hard 10 days easy. In addition to this - aim for a strict hard-easy-hard-easy day-to-day regime. The # 1 mistake runners do is to have too little variation between the easy and the hard training. And too little periodization in the general plan. The most basic element in human nature is the homeostasis - the internal balance betwen organs and metabolic elements. If you don't get on an easy-hard-easy element you will have a hard time challenging this in your training and get up to the next level - adapting your body to harder work, faster runs and much better performance. You'll find a number of marathon nutrition articles on this page. Because it is so important and cannot be ignored by anyone approaching the marathon. For a "starting point", go to Marathon Nutrition. This is the general page. From there you may also want to read about Marathon Race Day Nutrition. Calculating exactly how much to drink and eat beforehand is crucial to finishing with style. Without proper pacing, and actually knowing where you are in your training, the marathon can be a tough experience. Where can you read about marathon pacing ? Marathon Pace Article Is Located Here. Watch Out For Injuries When Approaching A Marathon Plan. Shoes. One of the main things you want when training for a marathon is good shoes. With good shoes I don't mean expensive ones ! Expensive shoes can be deadly to just your particular running style, toeoff. This cannot be repeated enough times. Take your time - go to a specialist shoe store and actually find out what shoes are best from you. This is my # 1 tips for avoiding injuries. For a long time I did not realize this but learning through the years, the shoes makes an incredible difference in terms of injury frequency. Some of you like very, very specific information. I will try and make it specific. However, since the most successful approach to running is from an individual view, approach, there will always be some a safety zone in each direction. It is those differences you see on the starting line in any marathon or running competition in general. This goes for marathon training, 5k training, half marathon training as well as for 10k training. One thing in common for runners though, is the runners high - the great rushy feeling while running. Therefore I have written a motivational piece on Runners High here. Ask Yourself : What Is My Strength ? What Separates Me From The Others ? What is my thing : ability to prepare/structure, your speed, anaerobic engine or your stamina. Once you know this, make sure not to get too far away from this strength. Once you know your strength and have a determination to keep this as a main focus in your training, you are ready to build those other aspects. I hope you are ready for some deep digging into your personal world of running. Have a Great Marathon Tip to Share ? Do you have a marathon tip to share ? In your preparation for a marathon/training, during the actual race or maybe recovery after a marathon. We would love to hear your tip (do tell a few words about yourself also). Want to see what others have said before you ? Look below the form to check it out. Well, as a small thank you, posting here gives you an automatic right to have one relevant question answered in the "Questions and Answers section" placed in the "Running Tip" section (see left hand-side menu).